It’s been a minute…I know, and I’m eternally sorry, but I’m making it up to you today with an amazing post! What I am featuring today is a student review of the graphic memoir Tomboy written and drawn by Liz Prince. 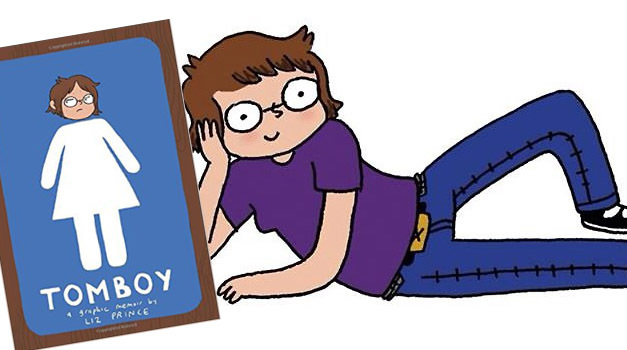 The graphic memoir Tomboy by Liz Prince is a nonfiction autobiography. Liz Prince talks about her childhood and how difficult it was just being herself. Prince was a tomboy and was judged because of that. She was bullied and talked about mainly because she is a woman who dressed like a man. She didn’t care about looking pretty; actually she didn’t want to be “pretty.” She loved playing with boys, dressing like boys, acting like boys; she just wished she was a boy. Liz didn’t like the color pink or wearing dresses, not even a bra when her mother thought it was the time to. Prince wore her father’s large clothing and people would make rude comments about it. Some people thought she was gay because of her choices even though she is not. This is one of my favorite books. I am really into non-fiction. I like to read about things that really happened. I also feel like I could somewhat relate to it. I wasn’t a tomboy growing up, but I got judged for being who I am, and Liz Prince definitely did too. I feel like Prince has a very strong personality, and because of this, other people’s opinions do not affect her as much. I’m sure it bothered her that people judged her, talked about her, bullied her, and kept messing with her, but she is strong. We can all learn a lesson from this. In the story, it was difficult for Liz to make friends. She liked to communicate with both boys and girls, and because of that, she had a hard time fitting in to one group. She wasn’t a super princess, pretty, glitter type of girl, but she also wasn’t accepted as one of the “guys” either. She was somewhere in between. Liz Prince was also often mistaken for a boy. She felt that she was supposed to be one too, and whenever she would play pretend, she was always a boy character: Indiana Jones, Luke Skywalker, Dennis the Menace, etc. My favorite part of the book was when she finally found a guy that really liked her, and the relationship lasted for a while, giving hope to any of us with the thought that we may never find someone. My least favorite part would have to be when some kids threw her hat away when she was swimming, and she went home sad. If I could change something about the book, it would be to add a little color to the illustrations. I would definitely recommend Liz Prince’s graphic memoir Tomboy. I would specifically recommend it to people that could relate to her, or people that get bullied or judged. I would also recommend it to people that feel like they need to change because of the way people look at them for who they are. Liz Prince stood up for herself, continues to stand up for herself, and does not let anyone control her mind or the person she truly is. I feel that the book could help people that go through the things that she went through. I wanted to know a few things about the book and the author herself, so my teacher contacted Liz Prince, and she was awesome enough to answer some questions for me! R.M. : After you grew up, was being a tomboy as rough as it was when you were younger? How is it different now as an adult? L.P.: Being a tomboy was definitely easier as an adult, because I had gained an understanding that someone else’s perception of you doesn’t define who you are. Meeting more people who didn’t buy into gender stereotypes made my support network grow, and having reinforcement from outside factors can help a lot in becoming more comfortable in one’s own skin. That’s why representation in media is such an important issue for many races and genders. R.M. : It looks like the actual writing/lettering could have been yours. Is it? If so, why did you choose to handwrite it? L.P.: I did hand write the text in tomboy, as I do in all of my comics, because my drawing style is so imperfect, that pairing it with a computer generated font really makes the text look out of place. I believe that an autobiographical story should really be penned in the writer’s hand (even if you’re like me, and your lettering actually isn’t that great!). R.M. : Who are your major inspirations…as a writer and in life? L.P.: The woman Ariel Schrag, whose book Potential I mention in Tomboy, is one of my autobio inspirations. Her comics are like reading her diary, complete with all the embarrassing parts that you can tell she wasn’t proud of. I really strive to show my faults as well as my strengths in my comics, because that’s what real people are: a mixture of good things and not-so-good things. In life, probably my biggest inspiration is my cat Wolfman, because she’s the best. Also, all of the women that I dedicated Tomboy to: that wasn’t just lip-service. R.M. : What inspired you to write this graphic memoir? L.P.: I had never seen a book, comics or non, that really dealt with this aspect of gender in such a personal and concise way. It isn’t an academic book, because I’m not an academic person, it’s just a story that I wanted (and in some ways needed) to tell. I’m hoping that people realize that it’s wholly personal experience, and that I don’t intended to speak for anyone other than myself, but a lot of people, both young and old, have written to me to say that Tomboy really resonated with them, and that is the best kind of gratification. R.M. : What does the success of the book mean to you? L.P.: The success of Tomboy means that my story was one worth telling! It can be difficult to put your personal experiences into a book like this, especially when readers can judge you solely on what you’ve written, so to know that Tomboy has inspired a lot of conversation with its readers, is extremely validating. I’d really like to thank Liz Prince for taking the time to answer my questions. She is seriously the best!